I love Fall, the hot summers are finally over and around here fall weather couldn't be more perfect. I also love fall colors and of course pumpkins and mums. 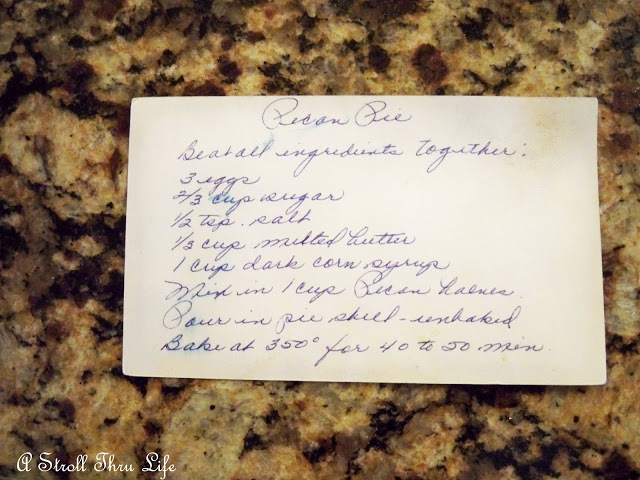 This is a recipe that I have shared before, but it is so good and one you all seem to love, so I thought it was time to share again. The cooler weather always makes me want to start baking and fill the house with wonderful smells of pumpkin, apples and cinnamon. 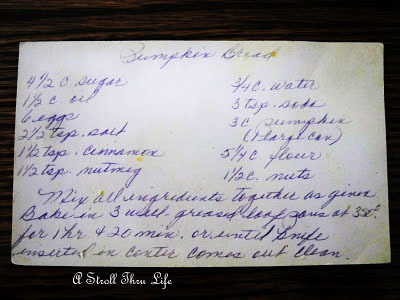 One of our very favorite things is Pumpkin Bread and I have an amazing recipe. Fresh, hot out of the oven and it smells soooooooooooooo good. This recipe makes 3 large loafs and freezes well. It is so moist and soooooooo good. I hope you give it a try. Mix all ingredients together as given. Bake in 3 well greased loaf pans at 350° for l hr. and 20 min. or until knife inserted in center comes out clean. When cool I always frost mine with a nice powdered sugar glaze. (Just add a small amount of milk to powdered sugar and stir until smooth, generously spread over the top of the loaf and let run down the sides.) These loaves freeze really well. I wrap them in heavy duty foil and then place inside a freezer bag and store in the extra fridge in the garage. You might want to try my Pecan pie too. it is fabulous. Getting ready for the Holidays is always so much fun. 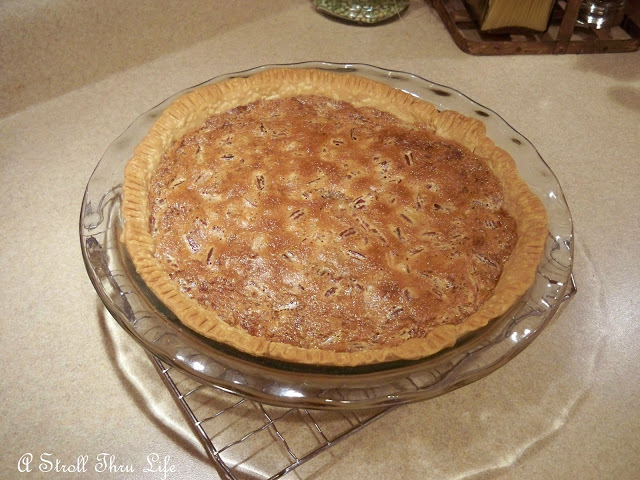 Your pecan pie recipe is identical to mine except I use the light corn syrup-my mom always did, too. Sounds delish and have it already saved! I'm with Diana, I love finding a recipe that makes multiple loaves! Thanks so much for sharing. I'll be making pecan pie for Thanksgiving, and yours sounds perfect. Hope you are enjoying our "finally Fall weather!" I've never made pumpkin bread. Love that it is good for freezing too. 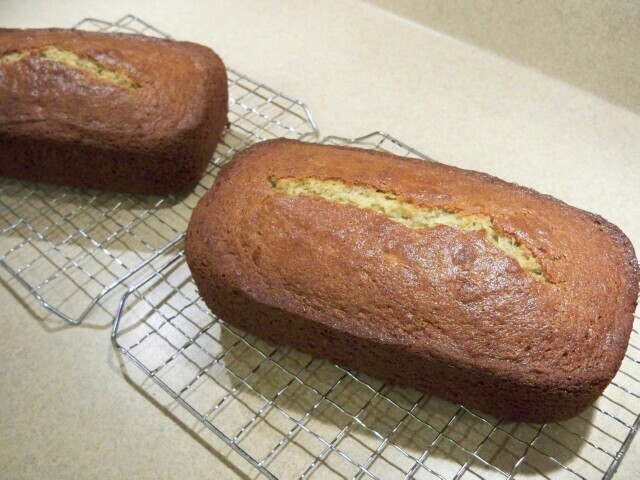 I LOOOVE pumpkin bread, so pinned this recipe! Thanks, Marty and have a great weekend! Your house must have smelled like heaven while this was baking, Marty! Sounds perfect on a rainy fall day with a hot cup of tea! Oh dear, I was hungry when I stopped in to say hi - and you have just made me sooooo hungry with your desserts post today, Marty! YUM! I have made both those for many many years, but it's been a year since - may have to try my hand at comparing our recipes and see if they're close. Thanks for the inspiration - it's such a neat time of year for baking and entertaining. I love love love pumpkin bread and any other thing that is pumpkin. Many thanks for the recipe will try it next week.